Even though we've just come off a long weekend here in the United States, I've got another one in front of me. Tomorrow is Rainbow's last day (and I use that term loosely, because it's really only about two and a half hours) of second grade, so I am taking the day off to attend her school's final assembly and then spend the day with her. The weather report isn't looking very favorable, so while we'll probably be out and about to run a couple of errands -- including going to get Rainbow's summer haircut -- I imagine we'll spend a lot of the day inside, which means crafting time for me. My two current WIPs look very much the same, though the ball of yarn currently being knit into my Boxy is getting noticeably smaller and my second sock is getting close to being ready for its heel. Tomorrow I'm hoping to pull out some of my washed fleece, my hand cards, and my mini combs and do some sampling. I don't know that I'm ready to process and spin the whole fleece just yet, but I at least want to have a sense of how I'm going to do it before I start that big task. I figure that a bonus day (because on the weekend I always feel obliged to do chores and errands and such) is the perfect time to do it. Outside of crafting time, I have been enjoying some other hobbies. I've been reading a lot lately, thanks to the wonder that is the ebook, and have finished several books. I've read two Kindle books about North Korea: A River in Darkness: One Man's Escape from North Korea (which was a Kindle freebie) and A Kim Jong-Il Production, which I'd bought some time ago after hearing a bit about the story on an episode of This American Life. They were both fascinating and heart-breaking reads, and given the current geo-political situation, they felt very timely. I've also read two books recently about lexicography: Word by Word: The Secret Life of Dictionaries and The Professor and the Madman. While the former is very much about the process of creating a dictionary, in the latter it plays more of a secondary role, with the focus more on a very interesting player in the creation of the Oxford English Dictionary. Finally, a book I could not put down (in a manner of speaking) was Brain on Fire: My Month of Madness. I bought it on Kindle after receiving a recommendation e-mail and really loved it. I'd describe it as a cross between Girl, Interrupted; one of Oliver Sacks's books; and an episode of House. What is most interesting to me, in looking back at the books I've read so far this year, is that half of them have been nonfiction and that all but four of them have been ebooks. I've always said that I'm devoted to physical books, but I've really learned to love digital books. I also just recently got around to connecting to Overdrive so that I can borrow digital and audio books from the library, so I expect that this is a trend that will continue for a while. An added bonus of reading a book on my iPad is that I can read while knitting or spinning! As much as I love a long weekend, I will say this: It really messes with my sense of time. All day today I've kept having to remind myself that it's Tuesday, not Monday, and that (as such) it's a blogging day. I didn't want to forget! Fortunately I have been looking at the calendar enough today to have remembered. It was a busy weekend but also a relaxing one. The Mister had been on a work trip all last weekend, so there was the usual catching up to do on laundry and things like that, but having another adult around the house meant that I got some extra time to myself. I was able to go for a run on Saturday and long walks on Sunday and Monday, so I got lots of steps in. When I posted on Sunday, I forgot to mention that while I was doing all the laundry (something like five loads) on Saturday, I also managed to finish washing the rest of my fleece. And of course there was plenty of knitting and spinning time. The second accomplishment of the weekend (after finishing up the fleece washing) was finishing the first sock in the new pair. I'm very pleased with how it turned out, and the pattern is already with my tech editor as I work on the second sock. My handspun Boxy has also seen a fair amount of attention while the Mister and I have been trying to get caught up with a couple of shows that we watch but that we can never seem to watch when they're actually on. I've reached about 14 inches of body and have switched over to second color shift -- the yarn is now two plies blue, one ply purple. I held up a measuring tape to my body last night, and I think I'm going to aim for about 20 inches in body length total. That should bring the body down below my hips, which is a length I'm much more comfortable with and that's more suited to my tendency to run cold. 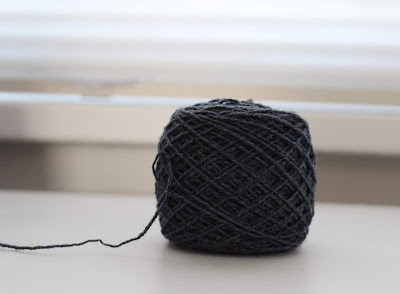 Given how long this second skein of yarn is lasting, I think I might skip the blue-only skein and go straight into the darker-blue-to-light-blue fourth skein. I might end up having to break it apart into each fade segment so that I can split them in half when it comes time to work the front and back separately, but I'll deal with that when I get there. After all the time I spent spinning for this sweater, you bet your wool I'm going to do what it takes to make it come out exactly as I want it! I have been on a spinning kick this weekend, and I have finished yarn to show for it! After finishing up the third bobbin of Starry Night Cheviot singles during the week, I spent nearly all of Friday evening and a bit of Saturday morning plying them all. Though the finished yarn turned out a bit thicker and with less yardage than I was hoping, I am nonetheless delighted with it. I didn't fully expect to get distinct stripes from the way I spun my singles, but I quite like how there are areas of one color and areas of subtle overlap. I'm pretty sure that when I knit this up, I'll get blurry stripe-like areas. After washing, it appears to be roughly sport weight, and it's around 280 yards. I think that should be enough to knit up a pair of shortie socks, and if I divide the yarn first and knit toe up, I'll be able to knit until I'm out of yarn. Almost as soon as I finished up this skein, I threw the next thing on the wheel -- some incredibly bright and shiny fiber that Rainbow asked me to buy and spin up for her at Indie Knit & Spin in March. I'm very nearly done (and actually will likely be finishing it up after I post this). This is Raindrops on Roses from HipStrings, and it's actually a very interesting fiber blend (as you would expect): 62.5% Merino, 12.5% viscose from roses, 12.5% viscose from bamboo, and 12.5% nylon. I am spinning the whole thing onto one bobbin, and then I'll determine whether I'll wind it off with my ball winder and ply from both ends or chain ply. The latter is likely to cause fewer problems, but I'll get more yardage from the former. Fortunately, I want to let the singles rest either way, so I have a bit of time to ponder. And maybe by this time tomorrow, I'll have another finished skein! Over the past couple of days, I've been pleasantly surprised by a number of things in my crafting life. First, I managed to finish the singles on my Cheviot spin on Tuesday evening while I edited the latest episode of the podcast. That means I'll be ready to start plying tomorrow! Second, I finished the heel on my toe-up socks and it worked out as I hoped! Third, I measured my sweater when I was ready to put it away last night and discovered that I'm already past a foot. There's still quite a bit of body left to knit, but I'm farther than I thought I was. We're coming up on a long holiday weekend here in the United States, and the weather forecast has some rain and thunderstorms in it. I'm planning to be out and active as much as possible when the sun it out and then take good advantage of the time when I need to be inside by working on my projects and, perhaps, washing the rest of my fleece. Hope you have a productive and restful weekend, wherever you are! Stash Dash starts this Friday, and I'm fairly certain that my goal will again be 10K, so my plan is to spend the week getting as much done as I can on my current WIPs without actually finishing anything. That was easily done for my sock blank socks, which are about 95% done as of the end of the weekend -- just about half a toe remains. My toe-up socks are going fairly quickly; I've just started the heel on the first sock, and I feel like I just cast on the sock anyway, so it's bound to be a quick knit. The colors are off due to a very overcast sky during my lunch break. The only project that won't be able to be finished up quickly is, naturally, my handspun Boxy, which is growing, albeit at a slow pace. The body is now more than 10 inches long! The pattern says to knit to 16 inches, but I have a feeling I'm going to want to add some length. That's still a lot of knitting to do, so I'm going to use Stash Dash as motivation to get it done. It will be a lot of meterage if I can finish it by the end of the summer! This weekend has been all about the wool. Yesterday I spent nearly all day doing loads of laundry (five altogether, in case you're wondering), and as long as I was going down to the basement all day, I figured I might as well wash some more fleece. I got two lingerie bags' worth washed up yesterday and also pawed through the first load that I washed last weekend. I'm planning to use some of what I've washed to do a little sampling so I can decide how I want to prep the rest of it. The staple length is a bit short for what I'd expect for a Romney cross, but that's probably because the fleece came from a yearling ram. I'll attempt some combing and some carding and see which looks best. Meanwhile, in between the trips up and down the stairs, I got some decent spinning time in yesterday as well. I finished up my first bobbin of Cheviot singles on Friday night and finished the second yesterday afternoon. I won't know for sure until the third bobbin is spun and the singles are plied, but it looks like my plan to line up the colors is more or less working! I won't both posting a photo of my Boxy; it hasn't changed much since you saw it last, and it'll look that way for a while yet. I'm also not posting another photo of my sock blank socks, though they're getting close to being finished. I've put them in hibernation for the time being so I can finish them up when Stash Dash starts. Yep, that's a toe. (And yes, those are my bright green pants.) I am knitting a pair of socks for myself toe up. What's more, this is also a foray into designing toe up. I've had a number of people who have told me that they really like my Non-Euclidian pattern but wish it had instructions to be knit from the toe up, so that is what I am attempting to do here. I am using a skein of Fibernymph Dye Works Bounce, one of my favorite sock bases, in a colorway called Favorite Flannel Jammies that I bought this past winter. I really like the colors and they really do remind me of flannel, which is perhaps not the best thing to be thinking about in the spring, but then again I've been spending my days at work with my space heater on lately so a warm thought is welcome. I've just finished the toe increases on these and so am now in a pretty mindless place until it's time to start the shaping for the heel. It seems I can't knit anything right now that's not stockinette in the round! In knitting my handspun Boxy sweater, I am getting a very similar feeling to the one I had when spinning for it: This all looks the same. This effect is magnified by the fact that I am often working on it at night, when it's dark outside and the lighting inside is fairly dim. I can see that the sweater is growing, but the fabric looks the same to me because the color change is so gradual and so subtle. I had to take a photo in bright light in the morning to really convince myself that the colors are, in fact, shifting. See those little pops of blue? That's the beginning of the first color fade. I spun the yarn on purpose to gradually shift from one color to the next. This is a three-ply yarn, so the faded skeins start out with all three plies being the first color, then they move to two plies of the first color and one of the new, then to one of the old and two of the new, and finally to all three of the new. The last time I measured the fabric, I was somewhere between 9 and 10 inches of body done. The pattern calls for 16 inches of length for the body, but that is also supposed to be a somewhat cropped length. My plan is put half the stitches on another circular needle when I get to that length so I can try it on. I suspect I will want to add additional length, as I have plenty of yarn and am not generally too fond of cropped sweaters anyway. My other current project is anything but subtle, and it's getting surprisingly close to completion. This is the second sock in the pair from my sock blank; I've just started the heel flap. If the first sock is any indication, I should be in that hot pink section on the blank when I finish. 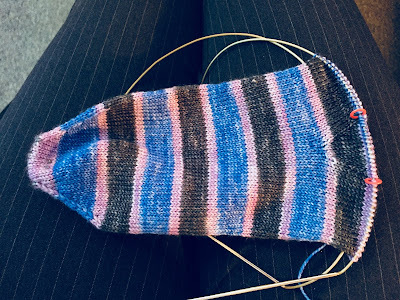 I think I could easily finish up this second sock this week, but I think I will probably put the project aside when I get to the toe so I can save it for Stash Dash, which starts next Friday. I hit my 10K goal last year, and this year I am hoping to at least match that. There may be a potential change in the calculation of spinning yardage, and if that happens, I may increase my goal. Regardless, I hope to use the event as good motivation to be productive and get things done. It turned out well but a bit low on the yardage, at only about 250-ish yards. I expected it to be lower than my usual, but it was much lower than I expected. It is perhaps a tad overplied, so I might run it back through the wheel to remove some extra twist, but that wouldn't give me much more yardage. I suspect it's mainly the wool, as it was a coarser, heavier wool than I'm used to spinning. Still, it feels good to spin up something from the stash. This skein will either go in my Etsy shop or will be used to make some shortie socks. Next, I decided to tackle one of my Rhinebeck purchases, some Cheviot from Classy Squid Fiber Co. in a colorway called Starry Night. I was pondering how to spin it to keep the colors fairly distinct and was all set on chain plying when I laid out the fiber and found that if I tore it in thirds widthwise, the colors lined up fairly well. So that's what I did, and to create shorter color sequences, I split each third in half lengthwise. Now I can spin a traditional three ply and have more or less distinct color sections. I'm about halfway through the first bobbin of singles and already love how it is spinning up. I've currently got the first batch of my Maryland fleece soaking and hope to have some to play with this week! I am one of those weird person who is perfectly happy knitting stockinette in the round for just about forever -- it's easy and mindless knitting, and I'm pretty fast at it. That said, I do occasionally like a little variety, but in looking at my current projects, it's all about the stockinette. My main project is my handspun Boxy, which I started on May 1 and worked on a ton last weekend. I knit on it pretty much the whole way down to Maryland on Friday and the whole way back home on Sunday, plus I put in some time on it on Saturday evening while we watched the hockey game and on Sunday night while I cried my way through the season finale of Call the Midwife. It's actually a bit longer than it looks here but that hem is flipping up as you'd expect (I'll show it who's boss when I block it). I have gotten through the first skein of yarn and joined in the second, but I actually wound off quite a bit from the second skein in order to get to the part where it starts transitioning from purple to dark blue. I was surprised that my first 350-ish-yarn skein got me about 6 inches of fabric, and while I will likely add some length to the body, I was starting to worry that if I knit up all the yarn from this skein, I wouldn't get to the lightest color in the gradient. I think what I wound off was less than 100 yards, so I still have a pretty sizeable skein to work with (we're talking 500+ yards). When I get toward the end of the skein, I'll see how much fabric I have and determine whether I'm going to use the dark blue-only or go right to the dark blue to light blue skein. The other stockinette project is my sock blank socks, and I'm nearly finished with the first sock -- I just started the toe. This one has gone much faster than I expected, considering I wasn't really feeling like I was in a rush to get this pair done. 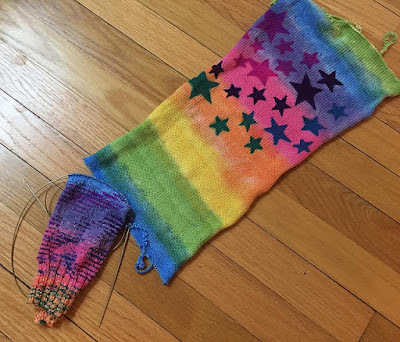 It looks like I should have a fair amount of yarn left in the blank, so provided it's enough, Rainbow should be getting a pair of ankle socks out of what's leftover. I'm very much looking forward to the weekend ahead and getting a chance to sleep in a little. We only have plans to get together with family for brunch on Sunday to celebrate Mother's Day, so I'm planning some serious relaxation (but also a run if the weather cooperates). I've got some handspun singles ready to be plied and obviously plenty of sweater knitting to do, so if the weather is less than optimal, I won't mind being stuck inside. Most times when I go to a fiber festival, I have a list of what I'm looking for or, at the very least, a list of vendors I want to visit. This time, other than buying the hackle, I didn't really have any specific thing in mind, though I thought maybe I'd look for yarn for a sweater and then just browse. There were certainly plenty of vendors I like there, so I knew there would be no shortage of things I could buy if I was so inclined. I also stopped by the booth of AmyBeth, aka the Fat Squirrel, to get one of her amazing bags -- but really only because my Boxy was already getting too big for its project bag. Yeah, that's right, it was a necessity. And of course I bought some more Hobbledehoy battlings (which you saw in my last post) because I got to know Liz a little bit at SSK and she's a real sweetheart in addition to being a very talented fiber artist. I think these two skeins will become a new shawl design -- I just love these two colors together! So that's it, and I think I did pretty well this year. I also brought home a little felted sheep pouch and some honey sticks for Rainbow, which she was thrilled with -- most of the honey has already been eaten and the pouch went with her to school today to be shown off. Now I'm off to knit so I can use up some of this stash! I'm back, only just, from Maryland Sheep and Wool, and I came home to much to do before starting the week and very little time to get it done, so this is just a short post from me tonight. I got in a little bit of spinning time before we left for our trip and finished up the second bobbin of my Southern Cross Fibre Spelsau. Two down, one to go. The sheep was coated so the fleece looks incredibly clean, and it's all this beautiful dark chocolate color (with some slightly lighter tips). I'm planning to wash this as soon as possible and do some carded and combed samples. It seems likely that I may be going to Rhinebeck again this fall, so wouldn't it be amazing to spin up and knit a Rhinebeck sweater from this gorgeous fleece? Tomorrow I leave for a weekend I've been looking forward to for months -- Maryland Sheep and Wool. I am headed down with two friends tomorrow morning and we'll pick up a third friend at the airport. Sadly, the weather forecast is not looking optimal (there's rain likely), so I'm packing extra shoes and a rain poncho. But a weekend full of wool and yarn and friends is automatically awesome no matter what the weather, right? I am taking just two projects with me, and they're the only projects I have on the needles at the moment. First is a pair of socks that I started earlier this week from the Gale's Art sock blank I bought at Rhinebeck last year. It's just a simple stockinette sock, but that's really perfect for traveling and walking around. I also cast on my next sweater on Tuesday evening, despite the fact that spring finally arrived and we hit 80 degrees earlier in the day. This is my handspun Boxy that I'm knitting with the HipStrings Buoy I spent all those months spinning. It doesn't look like must now, mainly because there are close to 400 stitches on the needles, but this will be perfect for car knitting because there is zero thinking involved -- I've done the three rounds of 1x1 rib and now all I have to do is knit until it's the right length. I've even been super ambitious and wound the second skein of yarn, which is about 650 yards, so I'll have to do an awful lot of knitting to run out before we get home. If you will be at the festival and happen to spot me, please say hi! I'll be back with an update of what I brought home at the end of the weekend. You may remember that when I released last month's sock pattern, I noted that it was the first in a planned themed collection. I'm excited to release the second pattern in the collection today, and you might think it looks a little familiar. 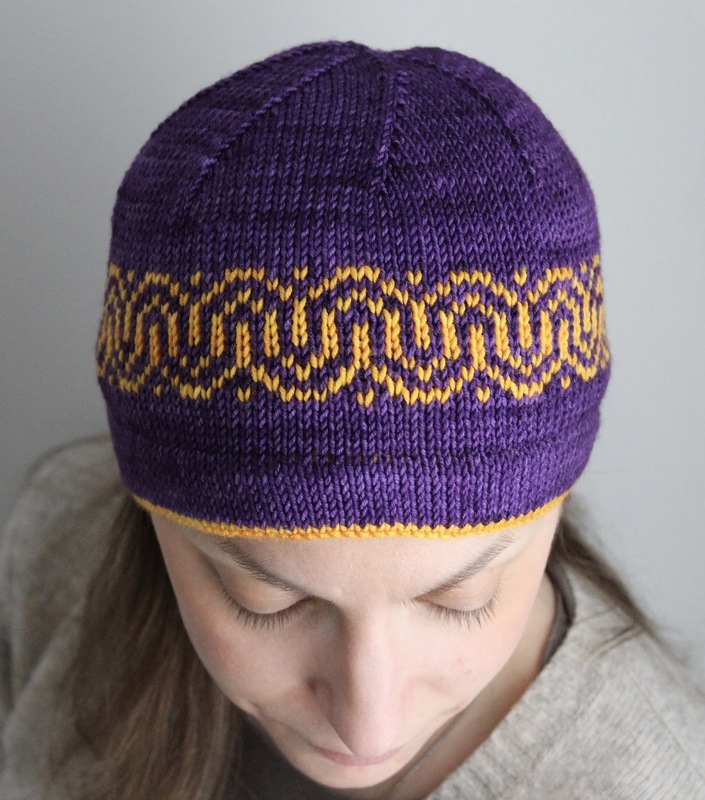 My Undamo Hat uses the same stranded colorwork motif as the socks and even the same colors, though this pattern is worked up in a fantastic DK-weight yarn, Marianated Yarns' Playtime DK. This yarn is 100% superwash merino and has a cabled construction, which means if you pull it apart, you'll see that it's composed of four strands that are themselves two-ply yarns. This type of construction creates a really round, really bouncy yarn with incredible stitch definition. Although it's not the typical yarn used for stranded colorwork, I think it works really well. This hat is worked from the bottom up, starting with a hemmed brim. 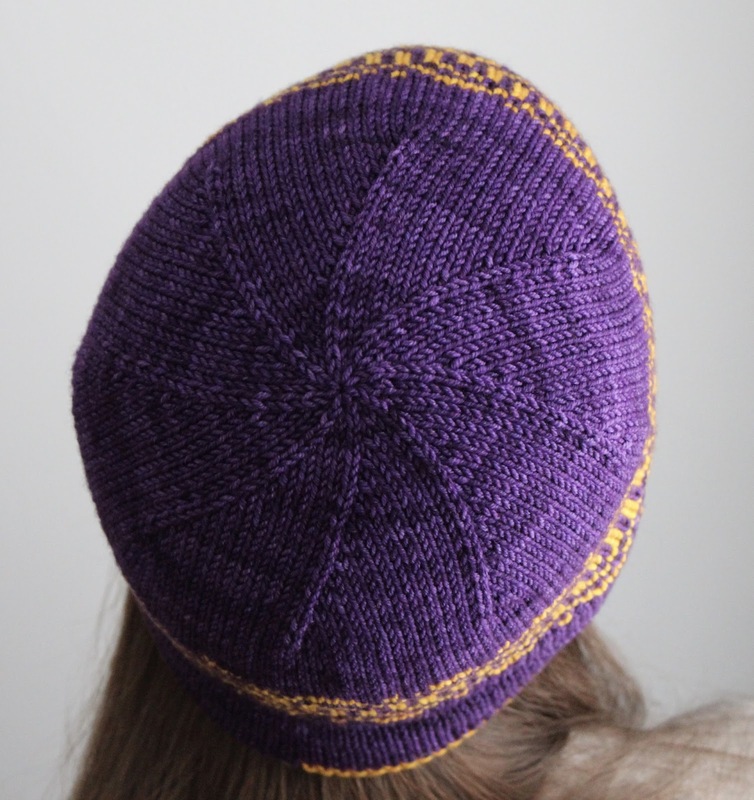 The inner facing of the brim is knit in the contrast color, as is the purled turning row, which gives that nice pop of color around the edge. The band of colowork makes the body of the hat move very quickly, and the crown is finished off with spiral decreases. I've graded the hat to five sizes, baby through adult large, and every size of the pattern requires less than a full skein of a typical DK-weight yarn, making this hat great for using up partial skeins and leftovers. I don't know about you, but usually at about this time of year, I find a bag full of leftovers and partial skeins of projects I've knit over the winter, and this seems like a good way to use them up rather than shoving them back in the stash and forgetting about them. Now I'm pretty sure I know what you're thinking (especially if you're in the Northern Hemisphere like me): It's finally spring -- why would I want to knit a hat now? Personally, I find hats to be great projects to work on during the normal months because they don't require having my lap covered in wool while I'm working on them and I feel very virtuous when we get our first cold day in the fall and I'm all prepared with a brand-new hat. Plus, isn't the summer a great time to get a head start on the holiday knitting?